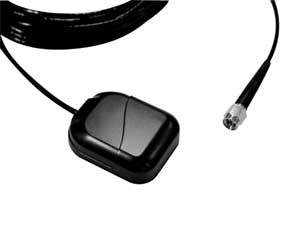 Stingray GPS antenna is the only innovating design antenna with performance, quality and an RF protection circuit built-in to protect the active LNA's, and most importantly the host GPS receiver down the connector end from the danger level of high power RF CW source exceeding over 1watt. The Stingray is a low profile GPS active antenna system for the next generation multi-purpose GPS mobile antenna products for Telematics, Fleet Management, Navigations and AVL applications. This small print size of the antenna design does not reflect over-all performance, since the antenna itself needs no ground plane aid to deliver the L1 band small signal carrier that originates from the 24 orbiting USA satellites located thousands of miles over-head and with the ground reception power sensitivity at over -130dB. The Stingray antenna is also design as a standard power input voltages in range from +2.5Vdc to +12Vdc with reverse polarity shutdown, over-current sense shutdown and an EMC power line suppression. The most important over-all design concept of the Stingray active antenna is the complete protections of the host sensitive GPS receiver made from any manufacturer that it serve and can also be destroy or de-grade using an improper design antenna. Wide input power supply voltage from +2.75V ~ +12V. RG174 double shield low loss, 2.7mm size. Short-circuit protection as standard design. BNC, SMA, SMB, MCX, MMCX, GT-5, Hirose-etc.